No other gem has captivated our fascination and admiration like the pearl. Diamonds may be forever, but pearls have been recognized as prized jewels for centuries longer than any cut stone. Almost all other gemstones are formed by mineral deposits that must be mined, cut, and polished to reveal their sparkling beauty. Pearls, on the other hand, are beautiful as they are - straight out of the mollusk. High quality pearls have an intense, brilliant luster and shiny iridescence that emanates from within the gem. For these reasons, pearls have become a symbol of purity and natural beauty. The pearl is the oldest known gem, and for centuries it was considered the most valuable. A fragment of the oldest known pearl jewelry, found in the sarcophagus of a Persian princess who died in 520 BC, is displayed in the Louvre in Paris. To the ancients, pearls were a symbol of the moon and had magical powers. In classical Rome, only persons above a certain rank were allowed to wear pearl jewelry. Pearls have been considered ideal wedding gifts. Pearls were rumored to cure hundreds of ailments. 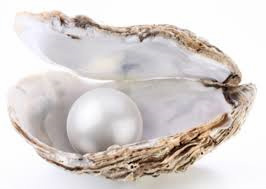 There are many more references to the pearl in works of great literature, and the lustrous jewels are often seen in famous paintings as jewelry, hair decorations and clothing adornments.symbolize purity and innocence.